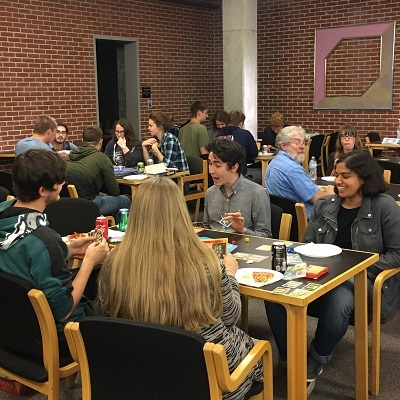 What began as an annual celebration of International Games Day now wins over students at the Libraries throughout the semester. The University Libraries have long supported games of all kinds, from board, tabletop, and video games collections to hosting Miami's eSports teams in the eSports arena. In that spirit, the Libraries began hosting an annual board game night on International Games Day in 2013. Saturday, April 6 • 6-10 p.m. The positive reception to the events prompted the Libraries to explore ways of attracting more participants. A partnership with Residence Life staff beginning in 2018 increases the events' visibility to first-year students and other on-campus residents. During Family Weekend, Wertz Art & Architecture Library delighted approximately 100 Miami students and their parents and siblings during a special family game night. Game Nights also invite collaboration with other student organizations and campus partners. The Strategy Gaming Club, Society of Physics Students, Fighters United in Costume, and Game Design Club have all teamed up with the Libraries for International Games Day celebrations. The Libraries also facilitated an Extra Life fundraiser, during which a 24-hour board gaming marathon in King Library raised money for Children’s Miracle Hospitals. This fall, the Libraries plan to partner with Hispanic/Latinx student club UNIDOS to spotlight traditional Hispanic games like Loteria and Dominoes. Miami Activities and Late Night Programming's generous support for food and prizes has greatly enhanced the Libraries’ Game Night events. Thanks to their assistance, the contributions of Libraries leadership and the hard work of its staff, average attendance more than tripled this year, with Game Nights welcoming more than 100 Miamians per event. Miami students, faculty, staff and families can join the fun at the Libraries’ next Game Night this Saturday, April 6, when Amos Music Library hosts gamers from 6-10 p.m. Fun-seekers should also watch for more details about the Libraries’ “May the Fourth” Game Night next month at King Library.